I’ve been following the Sea Turtle Conservancy’s Tour de Turtles, eagerly hoping to see how my adopted turtle, Shelley, was doing against the fierce competition! Unfortunately, it seems that Shelley is no longer transmitting. I’m not sure what’s up, but I’m guessing her tag fell off or ran out of batteries (I’ve sent an email to Sea Turtle Conservancy to find out the details). 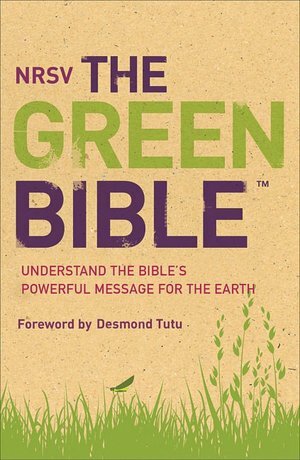 In honor of the big papal visit this week, I’m reposting about the “Green Bible” that my brother gave me a few years ago. I think Pope Francis might like this version too! Chickpea salad–a meat-free Friday treat! Endangered Species of the Week–the Maned Wolf! I’m a very fortunate person, because I’ve actually had a close encounter with this week’s endangered species, the Maned Wolf. Maned wolves are beautiful creatures who live in the grassy areas of central south America (parts of Argentina, Bolivia, Brazil, Paraguay, and possibly parts of Peru and Uruguay). These wolves (people often say look like “foxes on stilts”) are omnivores, hunting at night and eating a diet which includes fruits and berries as well as small animals like rodents, reptiles, and insects. Because of this diet, the wolves play an important part in their ecosystems, controlling animal populations lower on the food chain and acting as seed dispersers. One of their primary food sources is the lobeira berry -- this fact caused some difficulty when zookeepers were first trying to raise the wolves in captivity many decades ago. Zookeepers knew that the wolves were omnivores, but didn’t know about the importance of lobeira berries in their diet. Until they worked out this puzzle, the wolves often suffered from dietary problems in captivity. Tomato and Zucchini Pie–yes, it’s a main dish! I found out about this week’s recipe while watching Martha Stewart on the Today Show. I’ve taken her Tomato and Zucchini Tart and made a few changes to make the recipe a little more weeknight-friendly. It was a big hit with the family! Roll out pie crust in a pie pan. Spread the roasted garlic on the pie crust. Sprinkle about 1/2 cup cheese on the pie crust. Arrange the zucchini on the bottom of the pie. Salt and pepper to taste. Sprinkle on another 1/2 cup cheese. Arrange the tomatoes on the zucchini layer. Sprinkle with final 1/2 cup of cheese. Don’t forget to “like” greenmomster on Facebook for all the meat-free Friday recipes and other environmental news! Today is International Vulture Awareness Day! While some species populations, like the King Vulture (Sarcoramphus papa) pictured here, are doing well, other species populations, like the California Condor (Gymnogyps californianus)and the Andean Condor (Vultur gryphus) are less secure. These massive birds are nature’s waste management experts, cleaning areas of dead and rotting carcasses. Their bodies are specially adapted for this task with their bare heads and strong beaks. Want to learn more about the role of vultures in humans’ lives? Check out this fascinating NPR story about India’s vanishing vultures and India’s Parsis. 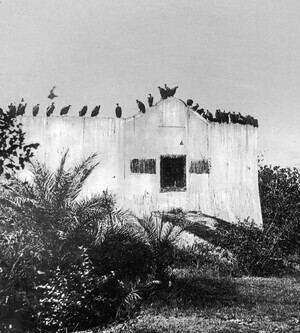 (photo from www.npr.org, showing a Parsi Tower of Silence, circa 1955, near Mumbai, India). Scientific American blog network recently reported there’s some good news for India’s vultures, thanks to a new ban on diclofenac, a painkiller used on cattle and buffalo. This drug can kill vultures when they eat the carcasses of animals treated with the drug. For more info, check out the full article. Endangered Species and Big Blue Live! Have you been watching Big Blue Live on PBS this week? This live show’s website explains that the program “celebrates a wildlife success story and marine animal phenomenon: humpback whales, blue whales, sea lions, elephant seals, sea otters, great white sharks and more all convene in Monterey Bay once a year.” The show includes lots of interesting marine factoids, live shots from above and below the water, plus film clips that provide extra, in-depth info. It also allows viewers to participate on social media. Kind of a fun way to spend an hour!